The Library’s Conservation team undertake several thousand conservation treatments each year, from the simplest of paper repairs to such highly complex conservation processes as paper bathing. There are many reasons a collection item is identified for treatment by Conservation. The item may be selected for digitisation or exhibition, or identified from within a larger collection as particularly fragile, requiring attention to ensure its long-term preservation. The aim of any conservation treatment is to reduce the rate of this deterioration and thereby lengthen the life of a collection item. One of the most complex treatments in the stabilisation of works on paper is the reduction of stains, discolouration and other soluble degradation products. Such blemishes are not only visually disfiguring, but may also cause or accelerate deterioration processes over time. The unforgiving nature and inherent fragility of paper, along with the type of media on its surface – be it watercolour, pencil, printing ink or fluorescent pen – determines how a work on paper can be treated, or if it can be treated at all. The reduction of stains, such as foxing, tape stains, darkening due to light damage or poor storage, or discolouration due to natural ageing have been traditionally treated using a range of water-based treatments. As seen below, in the blotter washing of an aged newspaper clipping. These are known as wet or aqueous treatments, often with the addition of alkaline solutions, or a range of solvents, or a combination of solvents and water-based cellulose gels. 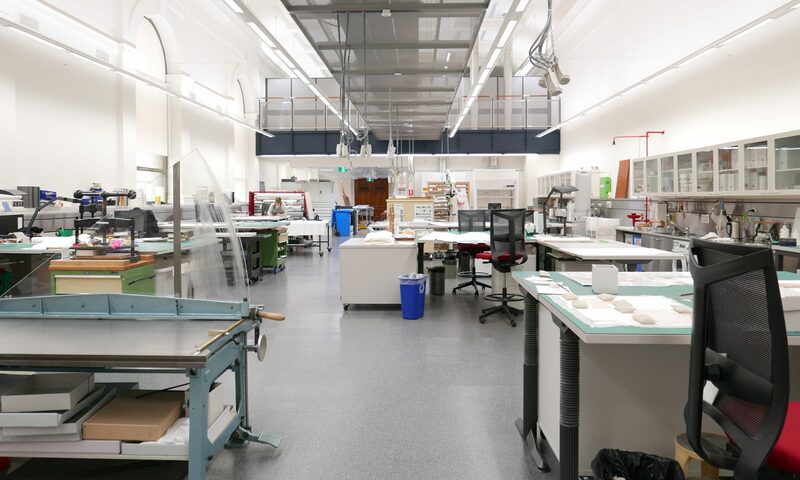 A great deal of knowledge, research and planning inform the decisions a paper conservator takes in the approach to these treatments. They may apply moisture locally to only a small area of staining, or complete a full immersion in a water bath to remove soluble degradation products. Increasingly, the conservation world has been looking to new solvents, gels and emulsions from the food and cosmetics industries to provide a wider range of non-toxic and environmentally-friendly treatment options. 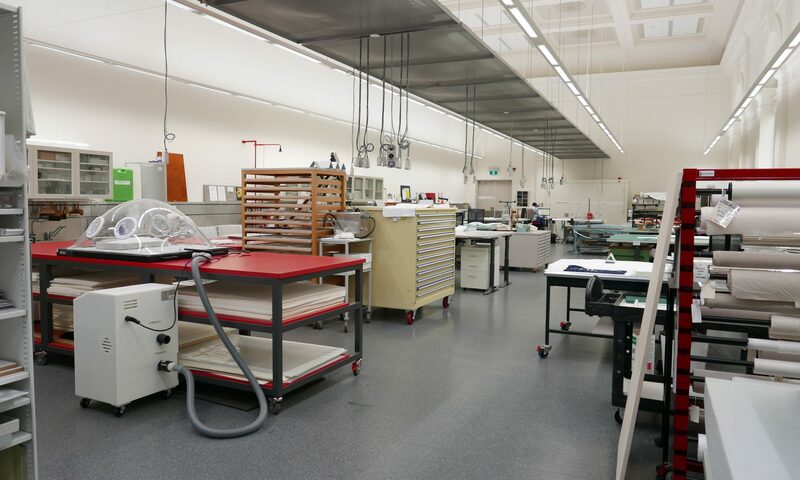 The aim is to develop materials and techniques that are safer for the practicing conservator, safer for the collection item, and safer for the environment. 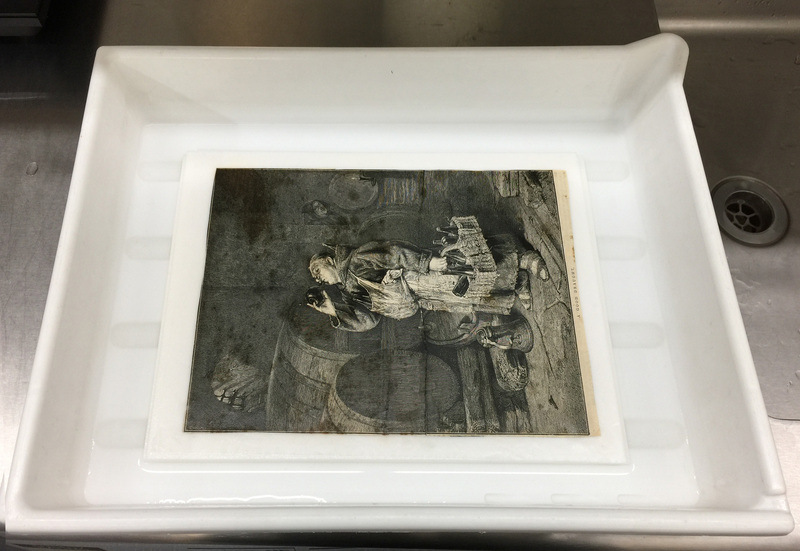 At the forefront of these advances in paper conservation is Associate Professor Richard Wolbers of the Winterthur Museum and the University of Delaware Program in Art Conservation (WUDPAC), USA. Richard Wolbers, an expert in conservation science, promotes cleaning systems that focus on ‘green chemistry’ principles. He recently shared his highly sought after expertise here at the Library. 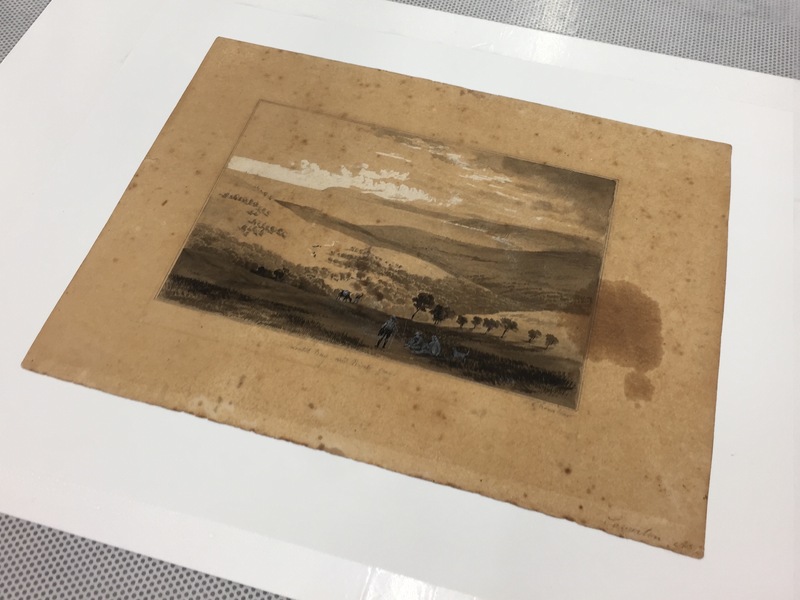 In January the Library hosted two paper conservation workshops with Richard Wolbers, organised through International Academic Projects and made possible with a generous grant from the Gordon Darling Foundation. 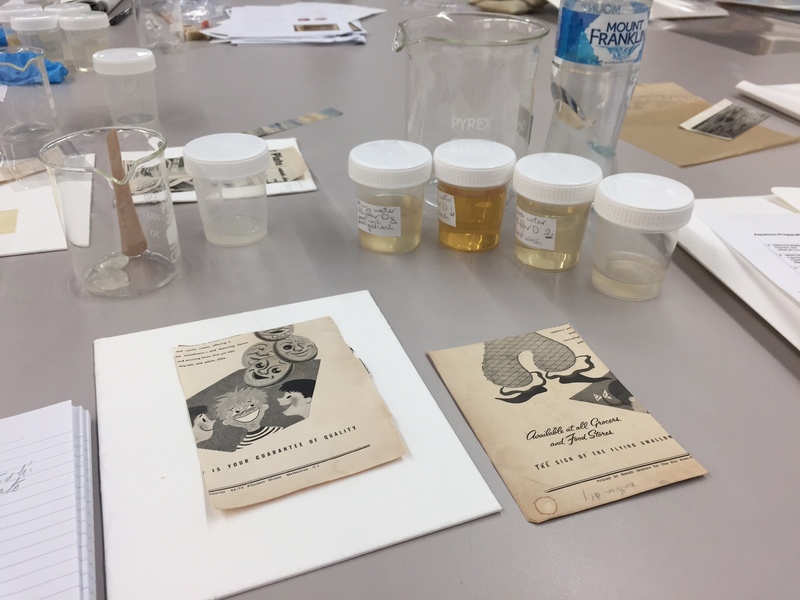 Forty-two book and paper conservators from private practice, museums, galleries, archives and libraries across Australia and New Zealand were excited to participate. Many of the conservators have been practicing for years while others were recent graduates and students, new to the profession. The conservators who attended were not disappointed. The workshop aimed to provide participants with the skills to engineer effective washing systems based upon close analysis of the work on paper and its damage, challenging and breaking away from many established treatment approaches in current use. We were introduced to new instruments that allow for non-destructive testing taken directly from the surface of an item – the battlefront where all chemical interactions take place. The Wolbers cleaning systems, though complex in their chemistry proved to be simple in application, highly effective and environmentally conscious. Wolbers’ methods greatly reduced the use of toxic chemicals and need for personal protective equipment, which are often necessary in more traditional washing procedures. The workshop transformed the way we approach the washing and stain reduction of paper objects. Wolbers was a game changer! We have already begun to apply these new methods to State Library collection material. Following the conclusion of the Wolbers workshop we immediately got to work. 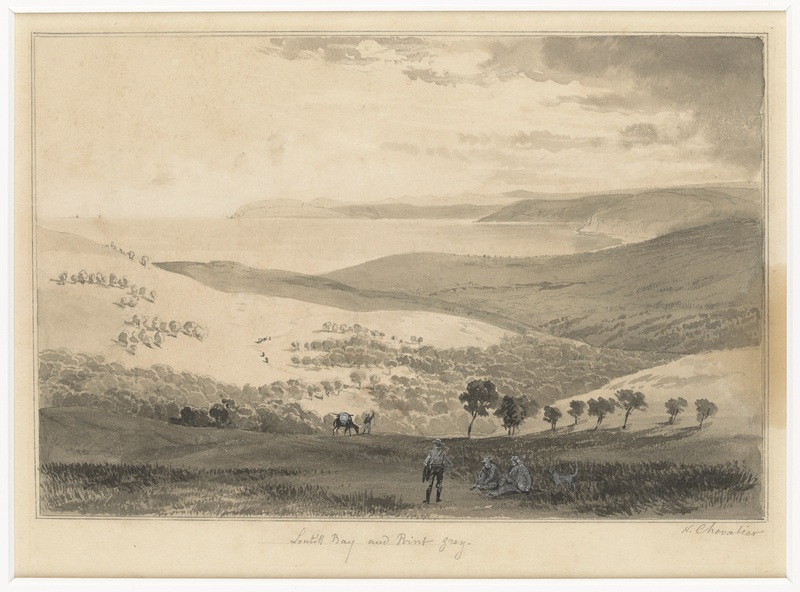 We had a collection item in mind, Nicholas Chevalier’s Loutill Bay and Point Grey, 1862. 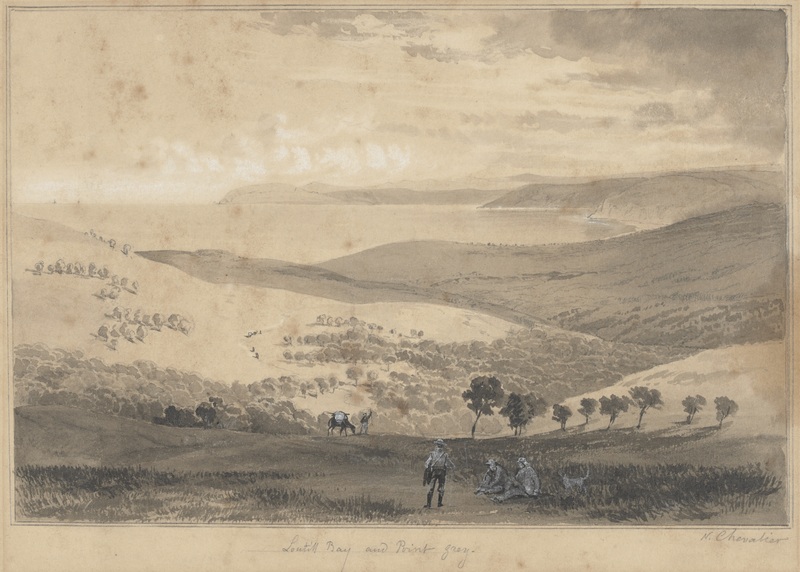 This work was selected to go on loan to the Ballarat Art Gallery, where it was displayed in the exhibition Eugene von Guérard: Artist–Traveller (24 March-27 May 2018). The small work is a fine drawing of black ink and white gouache on warm white paper. 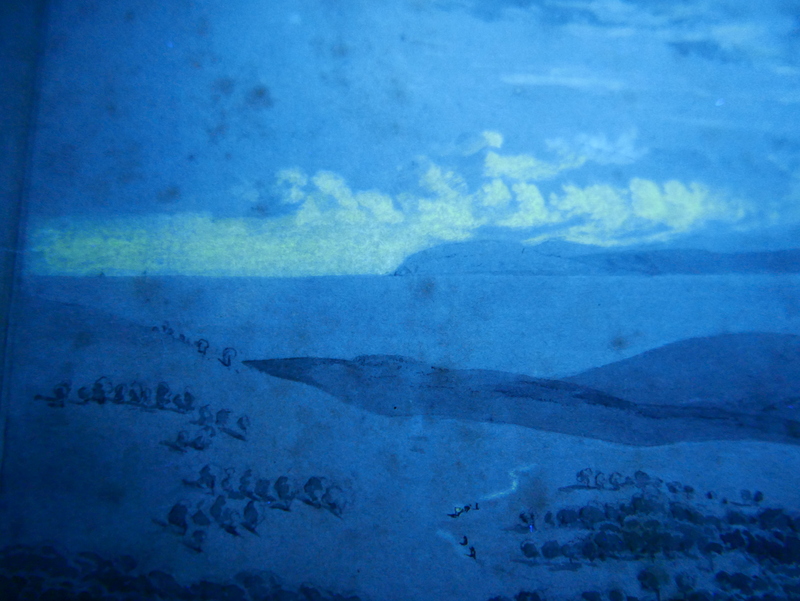 The paper is discoloured, with extensive irregular dark foxing spots caused by metallic impurities in the paper, and a very visible large brown oil stain to one side or the image. 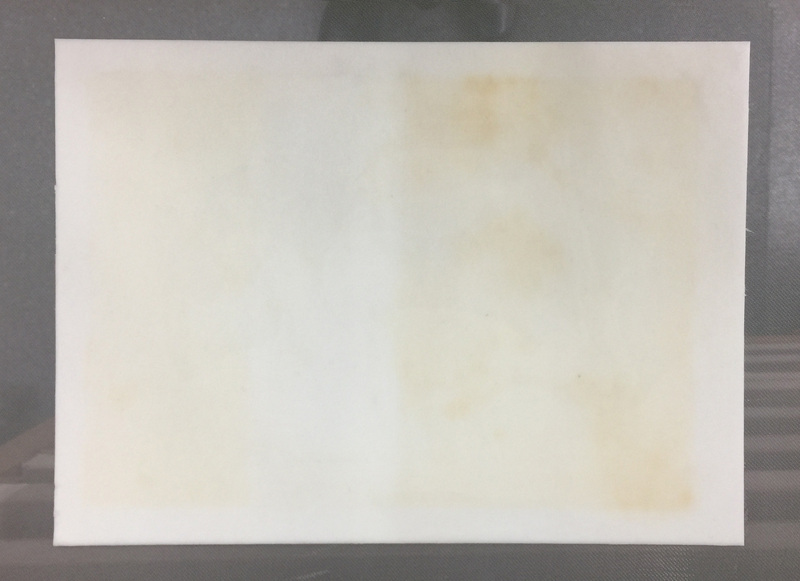 These stains resulted in visual disturbance of the image, and influenced our decision to use a water-based stain reduction treatment. Another complicating factor for this work was the white gouache, possibly a zinc oxide composition which is easily affected by many washing techniques. Traditional paper treatment methods could have been selectively applied to treat this work. We knew these methods would have reduced the overall discolouration, but would have limited effect on the oil stain or foxing spots, possibly making these even more noticeable against the washed paper. We could have reduced some of the foxing spots through localised bleaching, but this treatment could cause potential deterioration to the work into the future. The other risk was the possible loss of the white gouache by chelation during treatment. The Wolbers washing systems held the answers, by using a combination of three engineered solutions over the suction table. First a washing solution with a weak chelator was safely applied overall to reduce the discolouration, a stronger solution was brushed directly onto the large stains, and a third more complex solution was used to target the metallic impurities in the foxing spots. By this method we successfully treated Chevalier’s drawing with limited risk to the image. Not only were the various stains reduced, but we were able to largely remove the foxing spots without any impact on the white gouache, while perfectly preserving the warm white tone of the paper. In addition, fewer and less concentrated chemicals were used and all were safely disposed of. For the interest of those with keen eyes: while the white gouache elements in the sky may appear reduced, the paint layer is actually unchanged as confirmed through ultraviolet light examination. This reduced appearance is an unfortunate but common side effect of overall stain reduction, decreasing the strong contrast between the white gouache and previously darkened paper tone. The bane of a paper conservator’s work is the removal of adhesive tape stains – we find them everywhere, disfiguring works of art, manuscripts, books and maps. Applied with the best intensions, adhesive tapes are initially clear, flexible, and reasonably inconspicuous. However, over time the adhesive becomes very sticky and darkens. Next the adhesive turns brittle and the plastic tape on the top (the carrier) eventually falls off. At this point the paper is left with an insoluble dark stain that may only be removed with solvents. To treat this damage, the conservator dons protective gloves and mask, turns on the noisy fume extraction equipment and mixes up concoctions of test solvent mixtures, before slowly removing the stubborn stain. Following is a prime example of a “pre-Wolbers” tape stain reduction treatment. 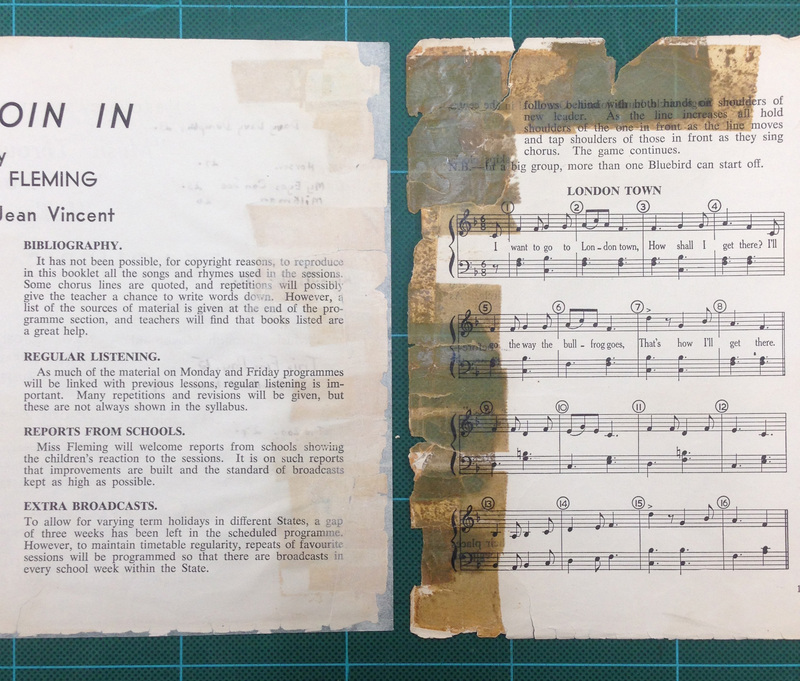 In this 1955 volume of the ABC Teacher’s Handbook – a programme of stories, rhymes, songs and dance steps for schoolchildren – masses of pressure sensitive adhesive tape simultaneously preserved the structure of the book while causing the paper to become stained, transparent and brittle. After many hours in the fume cupboard using existing techniques and solvent mixtures, paper conservators were able to reduce the worst of the tape staining, returning some opacity, strength and flexibility. However the unsightly stains and weakened paper in these areas is still evident. The Wolbers workshop introduced us to a safer, simpler and quicker method of reducing aged adhesive tape stains. 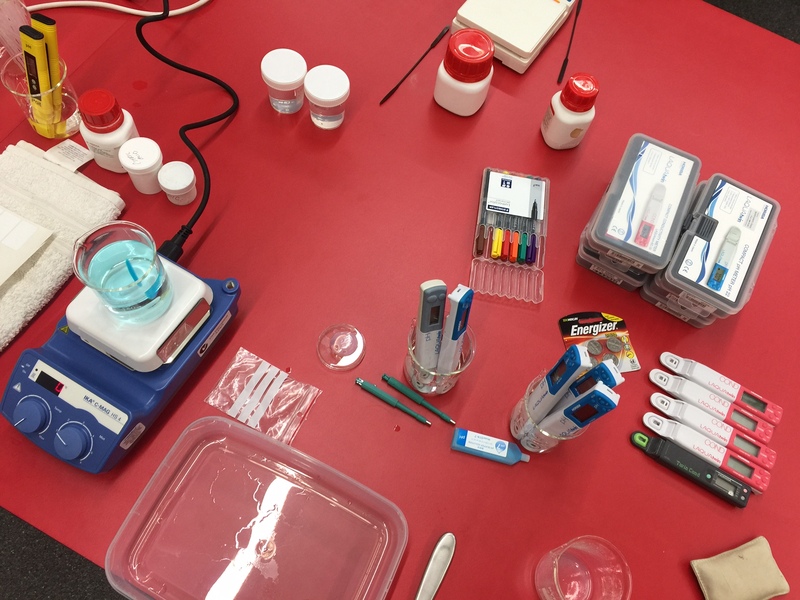 By using micro amounts of solvents in a gel emulsion and then manipulating the gel over the stain surface, in a matter of minutes we quickly and safely reduced the disfiguring marks from a test object without the need for quantities of toxic chemicals previous involved in tape removal. Fantastic article. Great to see the library employing new and cutting edge techniques. I wonder what happened to the white gouache following the treatment?